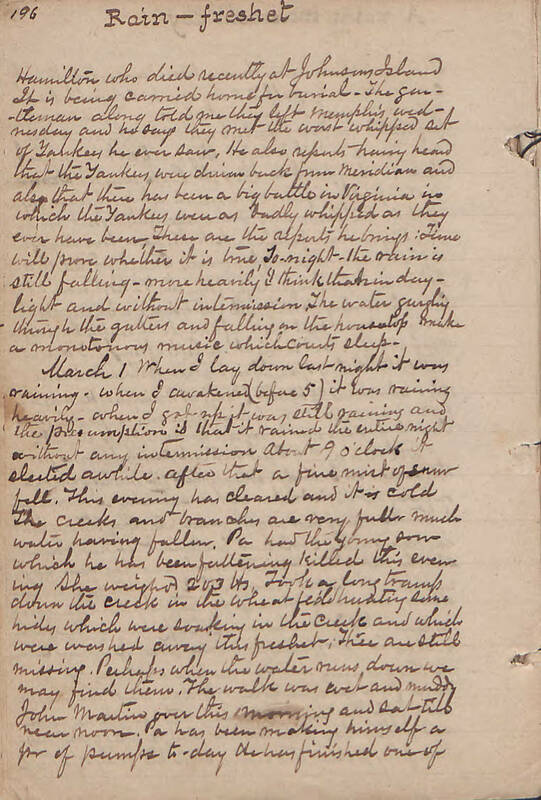 Item description: Diary entry, 29 February 1864, written by Samuel Andrew Agnew. Agnew grew up and attended college and seminary in Due West, S.C. In 1852, he moved to Mississippi, and thereafter lived in the northeastern part of the state, chiefly in Tippah and Lee counties, where he was an Associate Reformed Presbyterian minister, teacher, farmer, and prominent local citizen. Although Agnew did not actively serve in the Civil War, he resided in the area of operations of both armies. February 29 First noticed peach blooms for this season on saturday evening the 27th. Mother saw one on friday, but the first I saw was on saturday. It rained I think all of last night. And the day throughout has been rainy, cool and inclement. It has rained slowly but almost continuously and has been so unpleasant that I have mostly sat by the fire within doors, amusing myself by teasing and quizzing Erskine. Miss Davis was down this forenoon. Her father is no better, but perhaps worse. Frank Young came up this evening and sat awhile with us. Have heard from several sources today that the Yankees have left Meridian. Some say they have gone away and others they were driven. An ox waggon from Memphis passed this evening with the body of Lt. Col. Hamilton who died recently at Johnson’s Island. It is being carried home for burial. The gentleman along told me they left Memphis wednesday and he says they met the worst whipped set of Yankees he ever saw. He also reports having heard that the Yankees were driven back from Meridian and also that there has been a big battle in Virginia in which the Yankees were as badly whipped as they ever have been. These are the reports he brings. Time will prove whether it is true. Tonight the rain is still falling–more heavily I think than in daylight and without intermission. The water gurgling through the gutters and falling on the housetop makes a monotonous music which courts sleep. 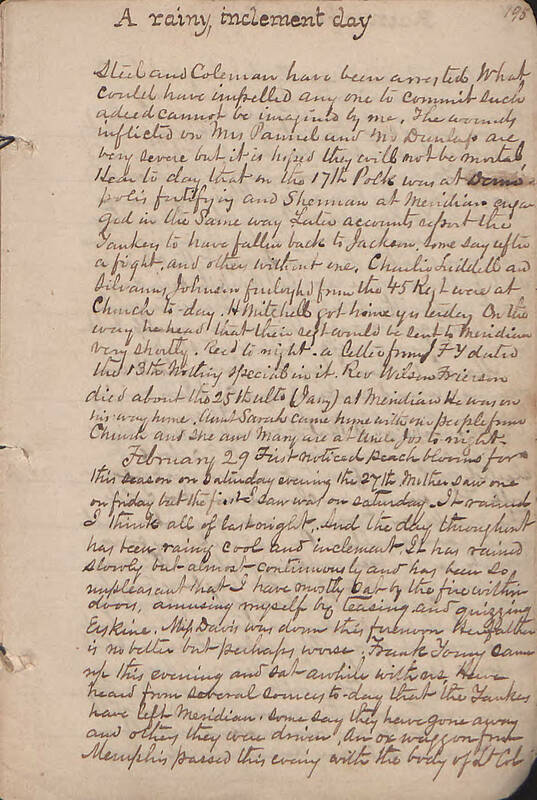 This entry was posted in Southern Historical Collection and tagged diaries, Samuel A. Agnew, United States Army. Bookmark the permalink.